1. Preheat the oven to 200°C, gas mark 6. Roll the pork in the cumin and some seasoning and set aside. Cut the onions into wedges, the pepper into chunks and thickly slice the courgettes. Chop the tomatoes if using fresh and peel, core and slice the apple. Drain and rinse the beans. 2. Heat an ovenproof casserole on the hob, add 1 tbsp oil and brown the pork on all sides. Remove to a roasting tin and set to one side. Wipe out the pan thoroughly, then add the remaining oil with the onion, pepper and courgette and cook for 5-6 minutes until starting to brown. Add the tomatoes, apple and beans with some seasoning and the juice or cider – the tomatoes and apple will make more sauce as the mixture cooks. Bring to the boil, cover and place in the oven with the pork on the shelf above and cook both for 35-40 minutes. 3. Remove the pork and stand for 10 minutes before slicing. Season the ratatouille, then serve with the pork and creamy mashed potatoes. 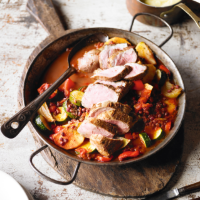 Any leftover ratatouille can be kept for a day or two and reheated for a quick supper with sausages or fish fillets. This recipe was first published in Wed Sep 10 10:45:40 BST 2014.